The next generation of PING’s 100%-milled putters are crafted and engineered to provide tour-caliber touch and performance through proven innovations like precision-milled, patented True Roll Technology (TR), plus a new custom-weighting system. The new system offers sole weight options in steel (standard weight head), tungsten (15 gms heavier than standard) and aluminum (15 gms lighter than standard) to match a golfer’s feel and balance preferences. 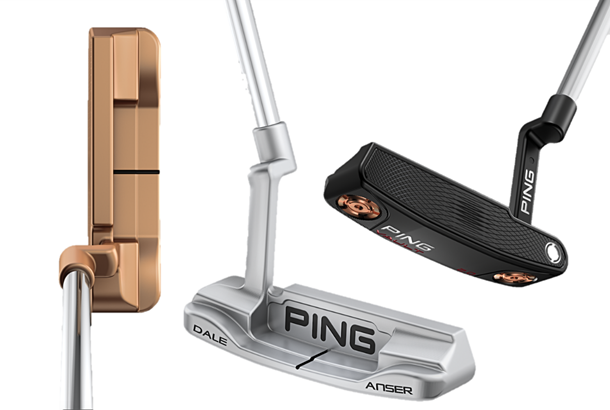 Golfers can choose from three premium finishes (Stealth, Platinum or Copper) in five models precision-milled from 303 stainless steel, including the new Dale Anser, which is inspired by one of the original Anser putter molds created by Allan Dale Solheim and detailed by his father, Karsten Solheim. The award-winning Ketsch mallet (Stealth or Slate finish) combines a fully-machined 6061 aerospace-grade aluminum body with a stainless steel sole plate for an extremely high MOI and offers exceptional alignment features. All the models are fit for stroke and designed with varying alignment aids to fit a golfer’s preferred look and alignment style. As part of the custom building process that ensures optimal balance, putters between 34" and 36" in length are built with steel sole weights; models 34" and shorter feature tungsten weighting; putters built 36" and longer use aluminum weights. Four proprietary PING Pistol tapered grips provide golfers with variances in shape and feel. The PP60 is a midsize, lightweight design with a foam under-listing and dominant flats for face awareness. The PP61 has an exaggerated pistol to fit the contour of the golfer’s hands, and a rubber under-listing for a softer response. The PP62 is a lightweight, oversized grip with a rounded profile. The CB60 is standard on custom counter-balanced putters in the line.